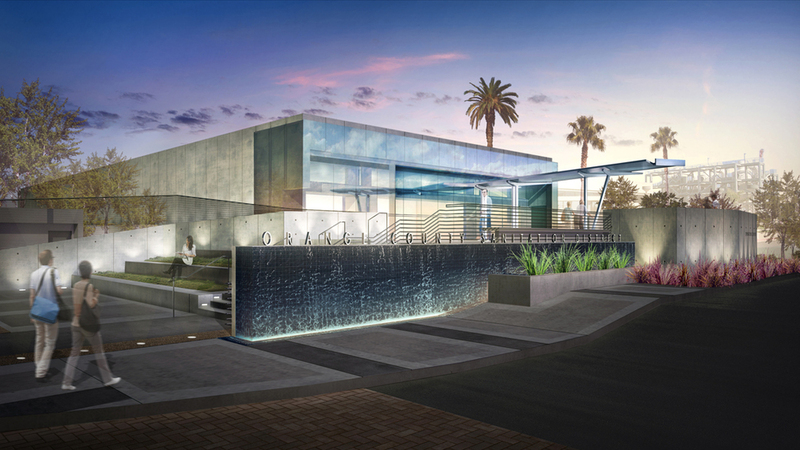 The Orange County Sanitation District sought to create a new face for their main headworks facility. HH Fremer Architects undertook this effort as an opportunity to re-brand the Sanitation District at the only facility on campus that would receive visitors from the public. Program included exterior gathering space intended as a starting point for Plant tours, as well as a welcoming receiving area for visiting Trustees and engineers from OCSD’s other plant campuses. Design needed to be sensitive to existing siting conditions. The south-facing Entry Plaza required protection from coastal heat and sunlight to accommodate the computer and server equipment at the SCADA counter just inside the new façade – computers that run 24/7 and monitor water treatment activities throughout the entire campus for over 200 million gallons of water per day. Shade is provided by a new canopy structure, and varying levels of privacy are provided by screening elements such that Plant activities are not in view of Operations Center visitors. A new water feature provides a tangible demonstration of OCSD’s purpose, and creates an inviting presence for the community OCSD serves. Plant location adjacent to a wetland habitat for protected bird species also required special consideration of canopy and glazing elements so as not to adversely affect migration patterns.